Surrounded by historic villages and rich culture, Camping Cerquestra overlooks the scenic Trasimeno Lake between Umbria and Tuscany. One of Italy’s largest lakes, Trasimeno is surrounded by beautiful mountains and picturesque towns. It is also home to delightful traditions, including renowned food and wine. This luxury camping site offers guests a full programme of activities, from sailing excursions and walking tours to kids’ dances and karaoke. A restaurant and pizzeria serve delicious meals, while a minimarket is stocked with local produce and other essentials. 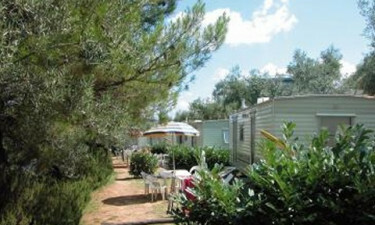 With all the comforts of a resort, Camping Cerquestra is sure to impress and inspire. Book your stay today with LuxCamp! Situated within the Trasimeno Lake Regional Park, this luxurious campground offers a peaceful and relaxed location for your camping holiday. 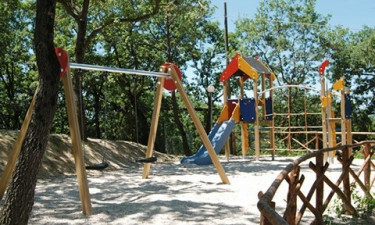 Pitches of different sizes are surrounded by beautiful oak and olive trees that create a cool and shaded environment. Whether you are staying in a mobile home or tent, this exclusive camping destination also delivers a fun experience close to nature. Cerquestra has a stunning swimming pool on a terrace with comfortable chairs and sun beds. Surrounded by olive trees, the pool area also has a welcoming bar serving cocktails, snacks and other refreshments. 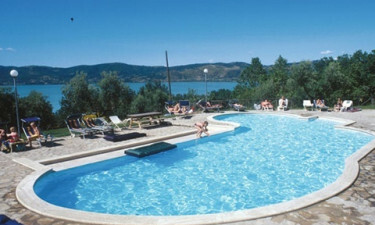 This luxury camping destination is about 400 metres from an intimate beach on the eastern shore of Trasimeno Lake. You can rent a bike or arrange a boat hire from the campground to explore the lake and its beautiful sights, including medieval towns and scenic islands.